Hudson is a large moving body with a nice first step. 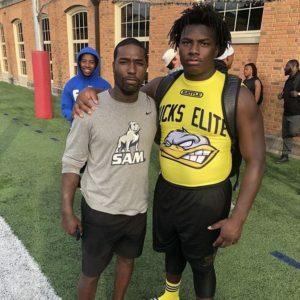 The 2019 recruit is just scratching the surface in the weight room and we think he can easily add another 30-50 pounds to his frame over the next few years. Hudson is very active, and plays with a really competitive spirit out there on the field. His Douglass squad has really emerged in AA. Hudson is tough as can be too, he just seems to crave contact, and this year he found himself at FB. From an upside stand point Hudson has a lot of potential, it will be interesting to see him develop heading into his senior year. He’s just so physical I don’t see how FBS/FCS don’t become interested.